This last week has been packed with playing with toys on the telly – and the kids you know are going to love these toys! My house over the last week has become a delightful treasure trove of wonderful toys. From remote control stunt vehicles, to scientific toys and the modern day version of a train set – I have been playing with them all. Why? Because the wonderful folk of QVC did their homework and saw that I was voted Top 30 Under 30 in the toy industry, judged by the toy industry itself which is incredibly flattering. With my background in Buying toys (as well as gadgets and gifts) and Presenting them they asked if I would come on and showcase a range of products on telly. An opportunity to play with toys… naturally I jumped at the chance. So this last week I have been on the tellybox with not one but 3 stunt vehicles. First up was the Turbo Twisters – a set of 2 stunt cars that perform wheelies, spin 360 degrees and flip over. One of the best things about them is their lack of learning curve because when the Turbo Twisters flip on their side or upside down, it can right itself using just the remote. That means that kids as young as 3 don’t have the frustration of going over to the cars, picking them up and setting them off again. They are indoors and outdoors, glow in the dark and are so robust they can even go down stairs. The next stunt vehicle is the HoverQuad – now this was the UK launch so was extra exciting. 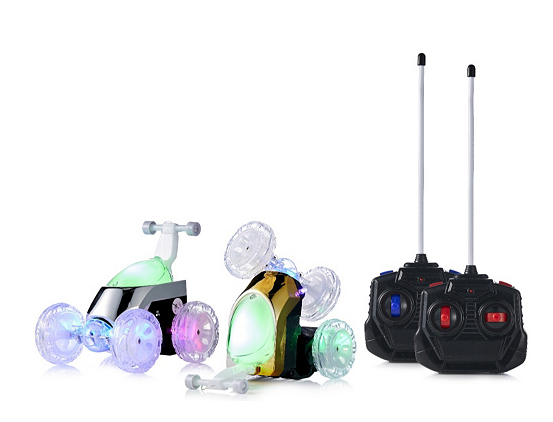 This is the next level up from Turbo Twisters when it comes to stunt vehicles and whilst the parts are all suitable for ages 3 years+ – I think the older kids of 6 and above will get the most out of this one. 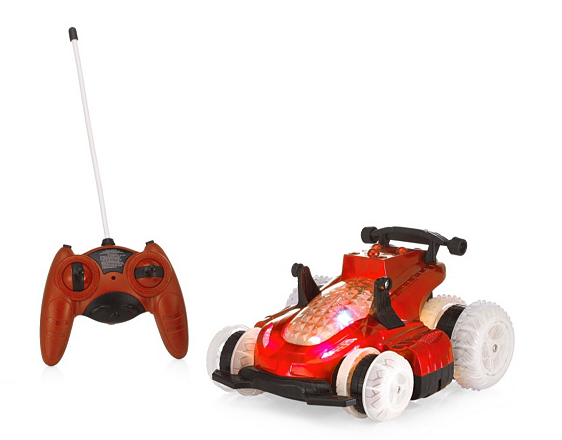 The HoverQuad travels at a whopping speed of 4mph – great for racing with siblings and friends. It can also go indoors and out and glows in the dark. The vehicle itself is pretty spectacular – the wheels invert so the car can drift from side to side (as well as going forward and backwards) and it looks like it is hovering in the air. Couple that with wheelies and 360 degree turns and other tricks and that is one fab RC toy. The Twister Tracks is the one I am referring to when I mention the modern day version of a train set. 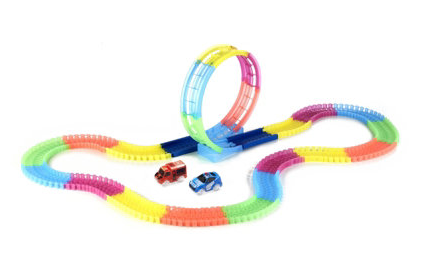 This is a track set that features 15 feet of track, a 360 degree loop the loop and a set of 2 gravity defying cars. I say a modern version because this is designed with innovation at the forefront – the track and the cars glow in the dark, the track itself can be manipulated as you are playing with it, you can separate one track into smaller tracks and instead of laborious and frustrating time spent setting up and packing up – it gets put up and put away in seconds because it rolls not stacks. Rolls… amazing. So no dismantling for the grown-ups hurrah! The little pocket-sized science toy I received is a major hit with my 10 year old sister Lizzi. 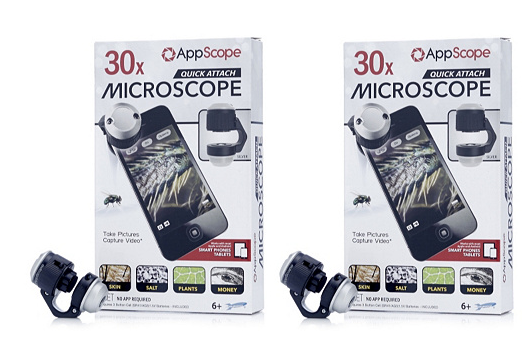 It is a portable mini microscope that you place over the top of the camera on a smartphone or tablet. 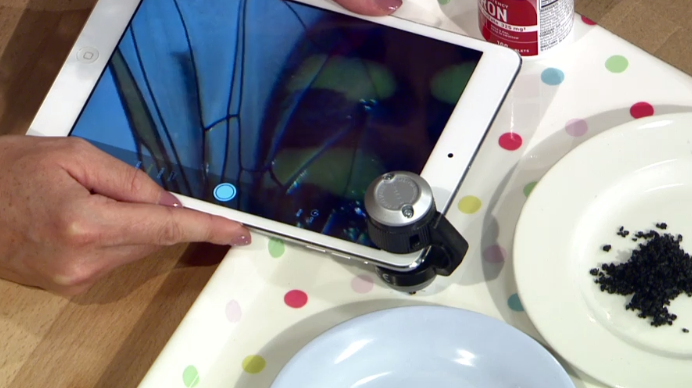 This then enables the device to look at whatever is underneath it at a 30 times zoom. Suddenly everything around you takes on new lease of life – the hair follicles on your arm, the fabric your jumper is made of, the bug in the garden, the £5 note you got in your pocket money. It is fascinating, fun and better still – educational without the kids really realising it.